I've always loved the thought and care that goes into iA Writer's typography. In fact, I like iA Writer's approach so much, I bought the Nitti family last year and have been using it as my writing font in Ulysses since. 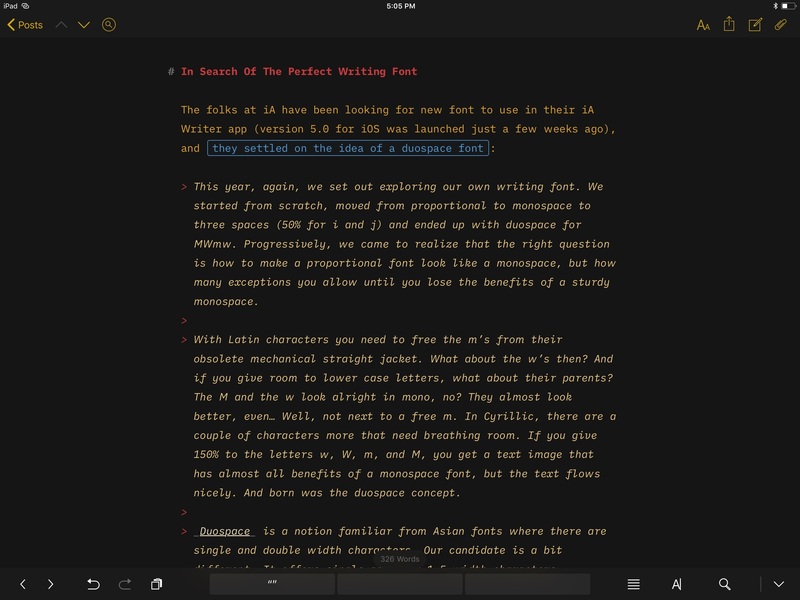 Standard Nitti looks terrific in Ulysses, but the new iA Writer Duospace (which is based off the recently released IBM Plex) is gorgeous as well. I mean, just take a look at this. I'm going to experiment with iA Writer Duospace as my writing font in Ulysses for a few weeks. Installing custom fonts in Ulysses for iOS is easy: go to the GitHub page, download each one, and open them in Ulysses (with the share sheet) to install them. Alternatively, I recommend using AnyFont to make custom fonts available system-wide in any native font picker for iOS.